Livestock Events Centre, the biggest of its kind in the southern hemisphere. 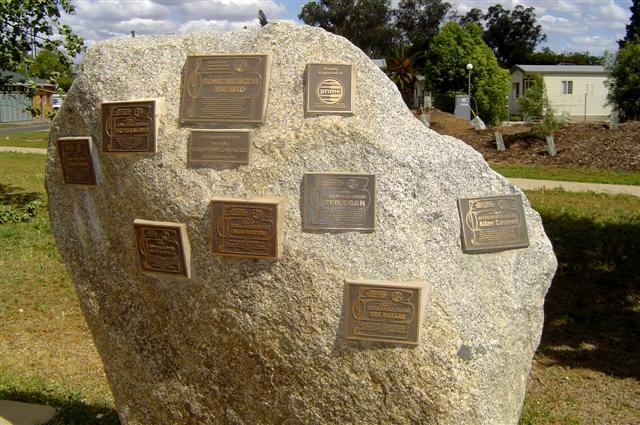 Tamworth was also the first city in the southern hemisphere to use electric street lighting, hence its “First City of Lights” tag. We first visited Tamworth on the way home from our Top End trip in 2009 and although we arrived late in the day and had only one night’s stay, we were impressed by the little we did see and promised ourselves that we’d return one day. Well, “one day” turned out to be only a few months later and we set off for a long weekend in this amazing city. It was a little after lunch time on a cool but sunny October day when we arrived at the Austin Tourist Park ([star][star][star][star]) in Tamworth. With so much to see and do here we didn’t waste any time getting our camp set up and then made our way to the Tourist Information Centre for some brochures. 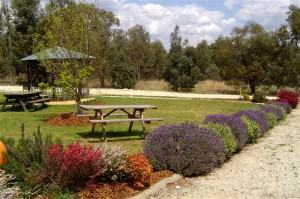 Behind the Information Centre is a path bordered by large stones. These stones each have plaques set into them for the Songmakers Tribute. Started in 1982, the tribute is presented annually to a song writer who has made a lasting and important contribution to song writing. Often overlooked in the guide books, it’s fun finding the names of some of Australia’s country music legends mixed in with more than a few names we’d never heard of. head to the lookout to watch the sun go down over the Liverpool Ranges. Apparently it’s the best seat in the house and I certainly wouldn’t have said no to their suggestion if it hadn’t been so cold. But the substantial breeze (howling gale was more like it!) had a wind chill factor that made Antarctica a garden spot! And so we made the trek back down to the tourist park and settled in for a quiet dinner and our “first night” ritual of a bottle of Two Tails bubbly. Saturday dawned sunny and bright, if a little cool, after a night that saw the temperature plummet to around a chilly 2°C (35.6°F). I shivered through my shower muttering things like“Whose idea was this, anyway!”, but thankfully, the wind had died down and the temperature was climbing with the sun. Dusty and today’s stars such as Lee Kernaghan and Beccy Cole. Each star was represented by a life-like wax figure in individual settings, and a mini-biography and I happily spent a good deal of time wandering around and reading about my favourite singers. Leaving the complex, we drove into town to Bicentennial Park, a brilliant expanse of green grass and ponds that are home to hundreds of ducks; a very peaceful and relaxing space in the centre of town. At the southern end of the park is the memorial to the Light Horse Brigade of World War I. A magnificent statue of a Waler horse, sculpted by Newcastle sculptor Tanya Bartlett, is a fitting tribute to those men of the ANZAC corps who served in the Boer, Sudan, and First World Wars. We wandered through the park watching families and children at play, fed the ducks some bread (I began to feel a bit like the Pied Piper when they started following us), and succeeded in avoiding being run down by hordes of children, young and not-so-young, on the bicycle paths. 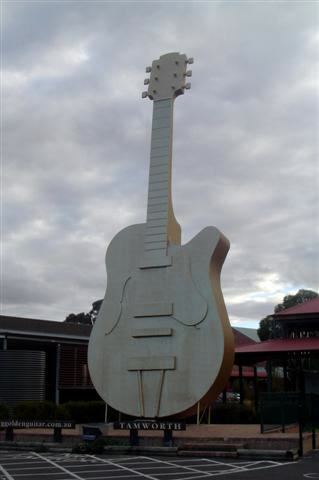 Near the northern entrance to the park stand four bronze busts, immortalizing some of our country music greats; Buddy Williams, Tex Morton, Stan Costa, and Gordon Parsons who wrote Slim Dusty’s most famous hit, The Pub With No Beer. These legends stand forever watching over our country music capital. 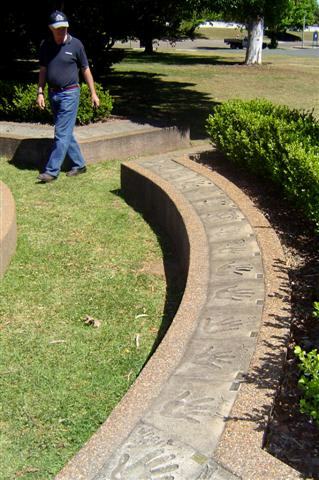 Across the road from the park is Hands of Fame Corner featuring the handprints of the stars set in cement. Sort of like a mini-Grauman’s Chinese in Los Angeles, it was fun picking out the ones that we recognised. It was in 1977 that the first hands were pressed into posterity and today there are over 270 hands of famous country music sons and daughters. for something a little more sedate and we both agreed that a visit to the Tamworth Regional Gallery was in order. 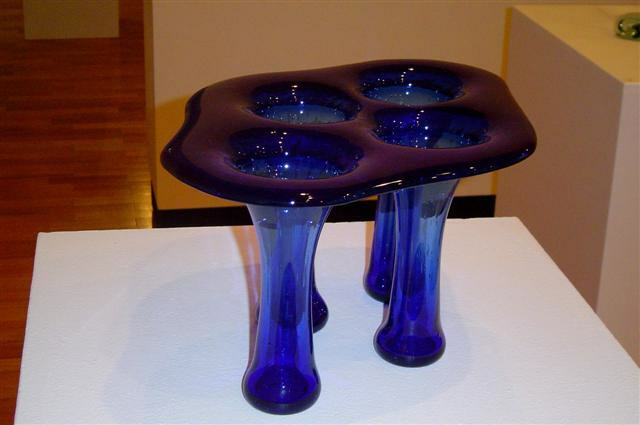 The Gallery is celebrating its 90th anniversary this year (2009) and it currently has an exhibition of porcelain and glass works entitled “Tame the Flame” by local artist Dennis Chapman. A teacher at the local TAFE college, his exhibition displays some truly outstanding examples of slumped glass work. Over its 90-year history, the Gallery has collected a diverse and varied range of art works from wood carving to delicate textiles and I was looking forward to seeing the glass exhibition as well as many other displays, little realising that our entire afternoon would be spent there. It was all so fascinating and terribly easy to lose oneself in the intricate artworks. There was one display of a plywood cityscape that just took our breath away. It was called “Shiftwork” by Richard Giblett and depicted the city with its mirror image as though on water. I can’t begin to imagine the patience one would need to do something like that; it’s way beyond me! Before we realised it, the afternoon had slipped away and the staff at the Gallery were waiting to close the doors. So, reluctantly, we made our way back to camp. We decided that we would have dinner this night at the SSS BBQ Barn and I have to say that it was one of the best steaks I have ever eaten. Friendly and attentive staff and the relaxed atmosphere completed the picture. And so, pleasantly satiated, we set off to visit Joe Maguire’s Pub and the Noses of Fame, the noses of some country music stars imprinted in concrete. I did wonder if they had to be sober when the imprinting was done. Well, it took some finding but finally we arrived at this much anticipated venue. And at that point our euphoria came to a crashing halt. Talk about disappointed! Outside on the driveway there was a bunch of holes poked into the cement and someone had scribbled some very illegible names there. I wouldn’t have thought that such a poor imitation of the Hands of Fame would rate a mention in the tourist guides, but it does. Very poor, very disappointing, and a total waste of time. settled in 1830, has but one claim to fame and that is that Fred Ward, alias the bushranger Captain Thunderbolt, held up the northern mail coach there in 1864. Exciting stuff! 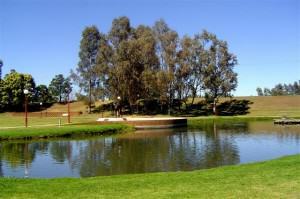 15 minutes north of Bendemeer on the New England Highway is Banalasta, quite possibly the Tamworth area’s best kept secret and a property like no other. It is 6011 hectares (approx. 14850 acres) and has a lavender farm, the largest certified organic eucalyptus plantation in the world, and a vineyard and winery. Wines are produced here under the Blickling Estate label. 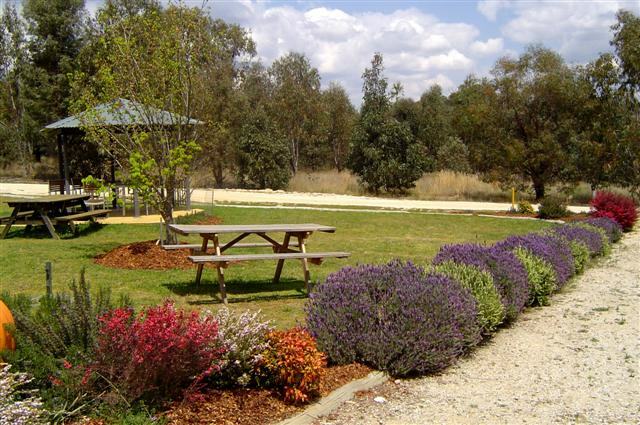 The beautiful gardens around the on-site visitor centre and the odd native animal wandering through make Banalasta a “must- see” at any time. Surrounded by cool and shaded verandahs for the summer months and a wood fire inside for when the weather is cool, the centre has a café that provides light lunches and morning and afternoon teas as well as a cellar door for wine tastings and purchases and a boutique shop where you can buy lavender and eucalyptus products made on the premises. I must admit that several of these found their way onto my credit card much to John’s amusement. seating for over 5000 people and is the biggest of its kind outside of capital city metropolitan areas. Since construction was completed in 1999, the centre has hosted thousands of events including concerts, trade shows, conferences, community, and charity events, to name a few. 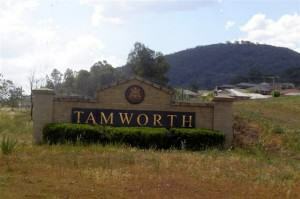 Tamworth is in the New England region of New South Wales, approximately half way between Sydney and Brisbane. 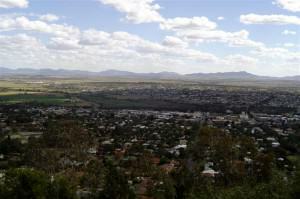 Located on the western side of the Great Dividing Range, the city sits on the banks of the Peel River and is the seat of government for the region. Although famous for the Country Music Festival, it is also recognised nationally as the sporting horse capital of Australia and is the headquarters for several major equine associations. There’s much more to Tamworth than meets the eye as we’ve discovered in our time there but our few days in Tamworth had come to an end and we spent a quiet evening packing up camp ready for an early start the next morning. 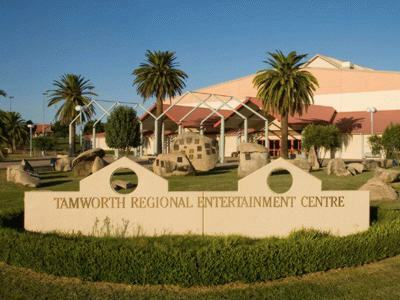 To say we’re impressed with Tamworth doesn’t quite convey our feelings; neither one of us would have any trouble living there permanently. 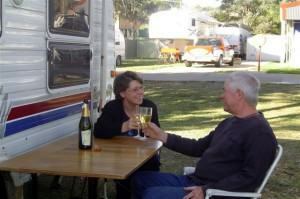 The town has everything you could possibly want and the people are open and friendly. If only it was a few hundred kilometres closer to the ocean it would be perfect. Tamworth . . . the welcome mat is always out.